While the Universal Monster shared universe may still be up in the air over at Universal Pictures, at least someone is carrying the torch into Comic-Con this year. The guys behind those awesome "ReAction Figures" have opened up a pop-up shop down at San Diego Comic-Con. In collaboration with Universal, Super7 has unleashed their Universal Monsters Boodega Monstore which is jam-packed full of #SDCC exclusives haunted by Super7 x Universal Monsters exclusives and spine-tingling special things created especially for this horrifying event. 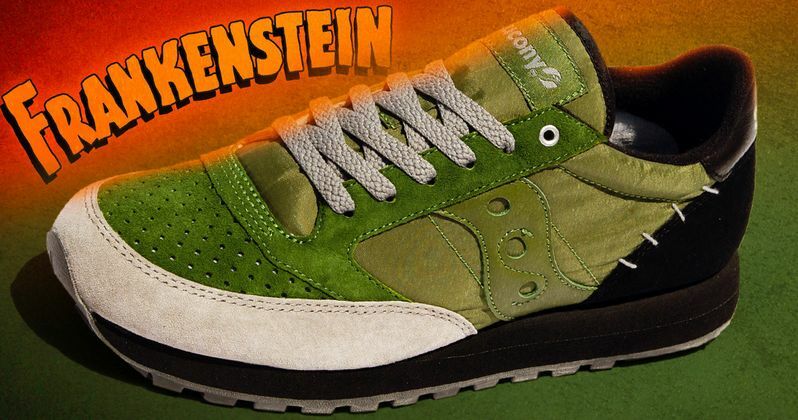 Universal Monsters Super7 x Saucony shoe collaboration based on the classic Saucony Jazz Original. SDCC Boodega Monstore Pop-Up Exclusive in very limited sizes and quantities. Only 12 pairs per style will be sold (1 pair each in sizes 7 through 13). SDCC Boodega Monstore Pop-Up Exclusive. $95 per pair. Universal Monsters Creature From The Black Lagoon, Metaluna Mutant, The Mummy and The Wolfman 3.75" ReAction Figure. SDCC Boodega Monstore Pop-Up Exclusive colorway and die cut cardback. $15 per figure. Universal Monsters - Soft enamel pins (The Wolfman, Frankenstein, The Mummy, Creature From The Black Lagoon). SDCC Boodega Monstore Pop-Up Exclusives. $12 each. Universal Monsters - High quality screen printed 7" x 21" felt pennants (The Wolfman, Frankenstein, Creature From The Black Lagoon, The Mummy). Made in America by Oxford Pennant. SDCC Boodega Monstore Pop-Up Exclusives. $25 each. For the full list of monstrous goodies, head on over to Super7. The abomination begins after sunset on Comic-Con Friday.